A radical bracing concept borrowed from the aircraft industry. All structural reinforcement is sculpted-out to form an extremely strong skeleton that reduces weight, increases rigidity and improves structural integrity. An innovative front facing, multi-vent porting system that uses individually tuned triangular ports to enhance each part of the bass spectrum. This goes way beyond the old standard design that has all your tone blowing out of one large port hole! Mesa's premium L-Pad horn attenuator provides players with the ability to fully adjust the level of the horn, ranging from OFF to fully ON or any point in-between, for exceptional stylistic versatility and performance. The Traditional 6x10 and 8x10 chambered cabinets provide emphais on focused low-mid punch and authority while still maintaining balance, detail, and clarity across the rest of the frequency range. Convenient Inputs AND Paralleled Outputs are provided for via "combination" connectors that feature both standard " and locking, SPEAKON high current connections contained within the same connector. Provides built-in, hand-truck portability with rollerblade-ease and rear glide rail protection. 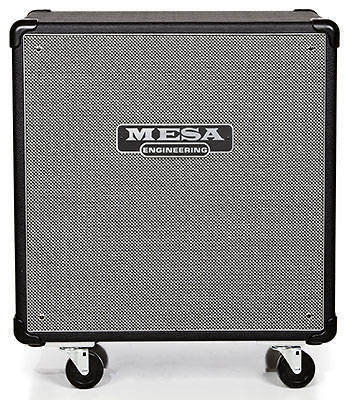 Like all Mesa PowerHouse Series Bass Cabinets, the Traditional PowerHouse cabinets represent the world's best built, best sounding, easiest to move bass enclosures ever made! But don't believe us. Make the comparison yourself. Then you'll understand why it's all about Mesa for Bass! Five great new models to match any style or performance application and move your groove! ALL MESA ENCLOSURES are built by Mesa Master-Craftsmen, using the finest Void-free, Marine Grade Baltic Birch. Super strong rabbet corners are glued and nailed and all backs are gasket sealed to ensure an air-tight seal. Baffles are fitted with superior dado joint construction and braced. Grilles are wrapped around a separate grille-board, not the baffle board. Grille material is made of strong twisted jute dipped in a special coating that filters top end for a sweeter response. You simply won't find a better cabinet.